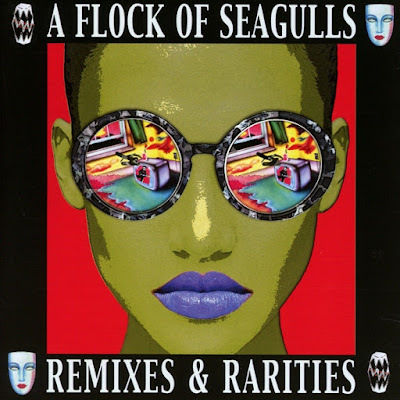 Discussions Magazine Music Blog: A FLOCK OF SEAGULLS/Remixes & Rarities review! A FLOCK OF SEAGULLS/Remixes & Rarities review! A Flock Of Seagulls – Mike Score (vocals/keyboards/guitar/hair), Ali Score (drums), Frank Maudsley (bass) and Paul Reynolds (guitar) – recorded some of the most memorable music of the ‘80s. On their first three albums, this Liverpudlian quartet created an intelligent blend of Post-Punk and Synthpop. Their Pop melodies were colored by Mike Score’s moody keyboards while Reynolds’ innovative, echo-laden guitar work inspired a new generation of young musicians. Sadly, Score’s aviator hairstyle distracted the critics from the band’s excellent musicianship, top shelf songwriting and clever arrangements and AFOS became a Pop Culture novelty conversation peice. Yes, the winged hairdo may have brought some much-needed attention in their early days but it became a burden as the band attempted to steer away from the image and focus on the music. Those first three albums as a quartet are nearly flawless. When Reynolds flew the coop - get it? - after the third album, the band’s style and fortunes changed and they quietly split up. While not exactly considered a ‘credible’ band during their existence (what do critics know anyway? ), interest in the band has never faded away: their musical legacy lives on in video games, motion picture soundtracks and satellite/internet radio. AFOS are proof that you can’t keep a good band down. REMIXES & RARITIES is a two CD collection on Cherry Pop that celebrates the work of AFOS in a new way. An alternative Greatest Hits collection, REMIXES & RARITIES is the perfect introduction to AFOS since it features nearly all of their radio hits and fan favorites in 7” and 12” mixes. Thankfully, it also includes some of their more experimental b-sides, a few live recordings and some rare oddities. While there are plenty of gems for collectors, this set is also geared to those that may not own any AFOS on CD and want a good selection of ‘hits’ and remixes. If Cherry Pop had released a collection of super rare tracks aimed strictly at collectors, they wouldn’t shift as many copies. So, I consider this a positive compromise: focus on 7” and 12” mixes of the hits and throw in as many obscurities as possible. Some of the tracks here are featured as bonus cuts on the Cherry Pop reissues of A FLOCK OF SEAGULLS, LISTEN, THE STORY OF A YOUNG HEART and DREAM COME TRUE. However, there are gems that are NOT included on those sets including – believe it or not – the 7” edit of “I Ran”! In fact there are FOUR versions of “I Ran” found here. Nearly every compilation out there has the album version, which is actually called the ‘Longer Version’ here. The 7” edit is the version that got played on the radio (featuring the repeated chorus fading out). There are significant differences in the 7” edit and full length version so it is good to have it on a legit AFOS collection. There’s also a live version and the ‘Edited Version’, which is the one used in the popular music video! Also, the 7” edit of “Space Age Love Song” is here as well. Ironically, I have never heard the edited version used anywhere else apart from the video – radio stuck to the album version. While the edited version was unnecessary, I’m glad to finally have it on CD. There’s also various versions of “Wishing (If I Had A Photograph Of You)” including the mega 9+ minute version. The edited version of the sadly overlooked “Transfer Affection” is here as well. There’s also a few different edits of “Nightmares” to enjoy. The 7” version of “It’s Not Me Talking” is certainly different to the album version. Sadly, I haven’t kept up on the myriad of AFOS compilations so some of these 7” edits could appear elsewhere but I’m happy to have them gathered here. Add in some of their experimental tracks (“Rosenmantag”, “…Yuri Gagarin”) some live tracks and the short version of classic b-side “Committed” and you’ve got a great compilation that you’ll go back to time and time again. During their short flight, nobody could touch AFOS. Far from a novelty band, they really were one of the truly great bands of the early ‘80s.